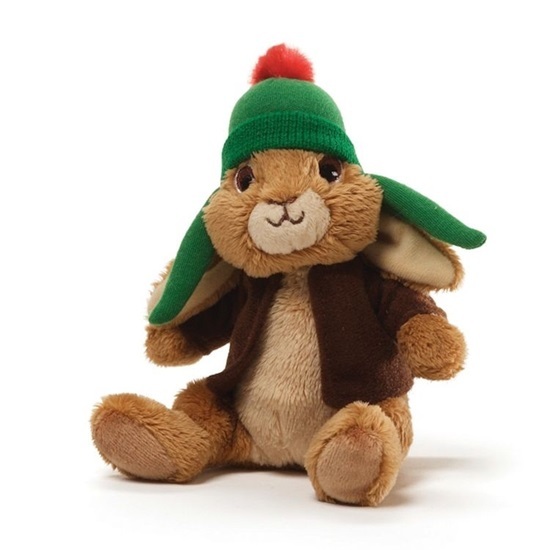 From the hit show on Nickelodeon, we are pleased to share "Benjamin Bunny"..
New in 2014 from GUND, we are pleased to share "Benjamin Bunny" a soft plush beanbag bunny based on the new hit television show from Nickelodeon. This is a 6-inch soft plush brown bunny with a light tan tummy and muzzle. The insides of his ears are a soft tan velour. He is wearing his classic dark brown coat. A dark green stitched winter cap with a red pom pom is sewn on the top of his head. Peter Rabbit is a rich and beautiful CG-animated, re-telling of Beatrix Potter's timeless classic children's stories from the early 1900s. The show follows our hero, Peter--a brave, mischievous, impulsive and resilient little rabbit. Peter is also brash and charismatic and possesses a quicksilver intelligence; he encounters real dangers, and he and his loyal friends and family must use their wits to outsmart incompetent villains whose barks are way worse than their bites. At 5, Benjamin is slightly younger than Peter, always up for anything Peter suggests and utterly hero-worships his big cousin. This 'funny bunny' is one of life's clumsy individuals. He always seems to be at the wrong place at the wrong time, usually ending in comic results. However, Peter couldn't wish for a more good-natured, loyal companion.